Dr. Rhoads is President and CEO for ETM Associates, Inc. a consulting firm that specializes in helping clients with enterprise, technology, and management issues. She works best with two kinds of organizations: (1) Small technology companies, (typically from 3 to 30 million dollars in sales), who have strategic challenges and need leadership guidance to succeed; and (2) larger firms, (mostly Fortune 500 corporations), with issues managing information technology [often due to the current economic climate] which must be resolved. Dr. Rhoads also shares her expertise at Kutztown University where she is an Associate Professor in the College of Business. 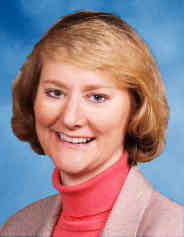 Dr. Rhoads started her career in the mid-eighties by building Computer Educational Services, a highly successful computer training and consulting firm. After selling the company to Hi-TECH Connections, a local systems integrator, she continued to grow the business - by 300% within two years. She eventually left the company she built and moved to Maryland to take a job as Vice President in the credit card industry - first at MBNA and then at First USA, both in Wilmington Delaware. There she advised senior management on how to make better technology decisions and improve processes throughout the firms. She moved on to become Chief Technology Officer at two internet startups: Millstar, an e-commerce software development company, and Commercelinks.net, a company developing a new use for videoconferencing: Live Video Customer Service. Dr. Rhoads is and has been active in many professional organizations including the Society for Advancement of Consulting, Berks County Chamber of Commerce Technology Committee, Society for Information Management, Association of Information Technology Professionals, and Women In Technology International (WITI). She has received many honors in her life including a quarterly President's Mile High Award at Hi-TECH Connections, a Financial Excellence Award from MBNA, and being featured for Women In Science and Technology by WITI. Most recently, she was awarded the John P. Schellenberg Award for Excellence in Teaching and Learning. From left to right, the people in the photograph are Kutztown University Provost Dr. Carlos Vargas-Aburto; Award recipient Dr. CJ Rhoads; Award sponsor Dr. John P. Schellenberg; and University President Dr. F. Javier Cevallos. Photograph taken by Jeff Unger at Kutztown University, used with permission. Dr. Rhoads is a prolific writer, with over a hundred articles and four books. Her articles have been translated into several languages, and two of her books are best sellers. She is also a dynamic and sought-after keynote speaker. She currently writes a column for the Eastern Pennsylvania Business Journal and another one for ERPtips journals called "CIO Corner". She is currently working on a book about the factors that enabled companies to thrive during times of economic upheaval such as a recession or a depression. She has a Doctorate in Educational Technology from Lehigh University with a minor in Business, and a Master's degree in Educational Psychology from Temple University with a concentration in Instructional Design. Her undergraduate degree is from Kutztown University.